Adam Lambert Talks Dating & The Love of His Life! You are here: Home / More Featured Posts / Adam Lambert Talks Dating & The Love of His Life! Adam Lambert broke his informal media silence and gave an interview to Ross King on the UK’s Lorraine. I can only hope his lack of recent visibility means he’s hard at work in the studio on his fourth album! 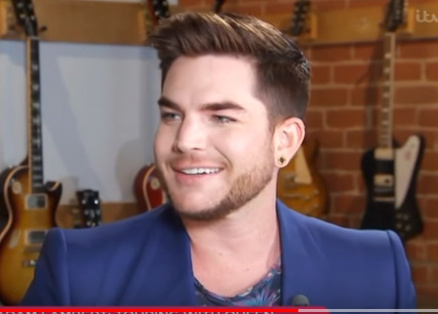 In this clip from the interview, he talks about dating on the Queen + Adam Lambert Tour and Pharaoh. I’m just wondering how Pharaoh is more of a queen than a king?? Thank you 2wofux* for the YouTube video. I could look at him forever!!! I could listen to him talk forever!!! I could listen to him sing forever!!! Love Adam. He is such an authentic person. When Adam talks he speaks from the heart. He is such an honest, loving person. He makes me happy from the inside out. Thank you Carol for keeping us up on Adam. It has to be so difficult to date as any kind of public figure. The psychoanalysis quote was funny, though. He seems like he’s taking it in stride. Great to see that he is still as down to earth as he has ever been. Still love him and his music very much. I am still and always have been a huge Queen fan. Sti hoping to o see them one day. you have the best job ever…. thanks for all your hard work and updates!!!!! I had the pleasure to meet Adam after the idol years on his first concert tour…………..an obsessed fan for life….. can’t wait for new music too!!!!! I watched this as well. I love this. He is such a great interview. He should have his own talk show like Corben some day…..inbetween touring and making albums of course…..oh and maybe doing a movie or TV show or something.